Dey For Love | Interview with Author Becky Lower! It’s a great day in America to interview the talented Becky Lower. She enjoys sharing her stories of American history, from the rugged West to the finer tables of New York. Let’s get to it. KARA: Hi Becky. It’s great to have you here. Let’s start off with a quick question: Which sub-genre of Romance do you feel the most comfortable writing in? BECKY LOWER: I love to write historicals set in America, since I’ve been fascinated by history since I was a child. The wild west was one of my favorite eras, and the Little House On The Prairie books. But writing stories based on actual events from history calls for a large amount of research, so I try to take a break between my historicals, and write a fun and sassy contemporary. BECKY LOWER: The first 500 or so words each day are a struggle for me. After that, the characters or the story take over and the scenes come naturally. When I go back at the end of my day and read what I wrote, if I don’t remember writing it, that’s when I know I got in the zone. BECKY LOWER: I spend a lot of time thinking up names for my characters. I give them unique names and basic characteristics, but I don’t spend a lot of time on them. I’ve seen methods where you give a character a birthday and design the character around the zodiac sign traits. That’s too much work for me, and it’s limiting your character’s movements. If my character has a good name and a good backstory, they usually will round themselves out as I write the story. I prefer to let the characters tell me who they are, rather than the other way around. KARA: Pick a first book to one of your series. When did you get that hunch that told you these characters would continue on in another book or that their story wasn’t entirely done? Did you choose the same main characters or did you explore some supporting characters’ lives? BECKY LOWER: The idea for my Cotillion Ball series was my “aha” moment. I love the Regency era debutante balls and all the formalities of life in that time frame but have no interest in English history. I read something about a young lady being introduced into society and planning her Cotillion, and I thought, yes, we have had Cotillions in America for a long time! So, I started exploring the roots of the Cotillion tradition and discovered it was introduced to New York’s finest in the mid 1850s. As the nation was moving toward the great Civil War, it seemed to be an era that was rich in history, so I am able to combine the Cotillion and high social season with the incidents leading up to the Civil War. Fortunately, my family has nine children, so there are a lot of stories yet to come. KARA: Excellent! Tell me about your featured book. Why did you write this particular story? Was it simmering peacefully on the back burner or did it startle you like a kitchen flash fire? BECKY LOWER: The first two books in this series were about some of the Fitzpatrick women. But Basil, one of the Fitzpatrick boys, had played a large part in the first book, and I had readers ask for his story. I had never written from a man’s perspective before, and I was surprised at how much I enjoyed the experience. There are some really explosive scenes between the hero and heroine, and it’s all due to approaching it from Basil’s POV. I can’t wait to write the next brother’s book. Halwyn’s journey to the altar is about to begin! KARA: Sounds exciting!! Thank you so much for stopping by, Becky. Basil Fitzpatrick was born into a life of privilege. In 1856, at 23 years of age, he is the owner of the St. Louis branch of the family banking business. He has his pick of the ladies and life by the horns. Temperance Jones and her family are far from privileged. Her father is a circuit-riding preacher from Pennsylvania. But the rumblings of a war between the North and the South force the preacher to move his family to Oregon rather than to take up arms against his fellow man. However, hardship and sickness slowed their pace, and they are forced to spend the winter in St. Louis, waiting for the next wagon trains to leave in the spring. Basil is drawn to the family the moment they roll into town, partly because they remind him of his own big family in New York. But also because of the eldest daughter, Temperance. She is a tiny, no-nonsense spitfire bent on fulfilling her father’s wish to get the family safely to Oregon. 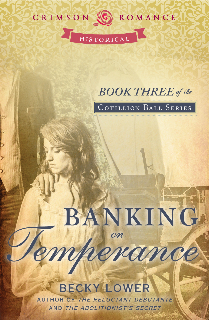 Basil knows if he allows Temperance into his heart, he is accepting the obligation of her entire family. He wants Temperance like he has wanted no other, but is the burden of her family too much? And remember: Whenever, and wherever you can, support local!! 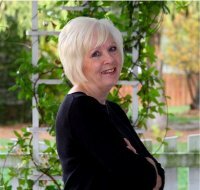 2 Responses to Interview with Author Becky Lower! i love stories written from the male p.o.v. looking forward to reading this one, becky. Thanks, Nora. I really enjoyed writing this one. Male POV, strong heroine, wagon trains…who could ask for any more? I hope you enjoy reading it as much as I enjoyed writing it.